I know, I know. The holidays shouldn’t be the time to think about calorie-cutting. 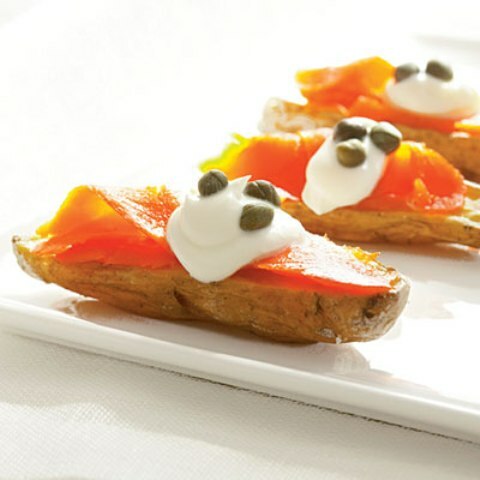 However, Lucia Schnitzer of Luci’s Healthy Marketplace in Phoenix provides easy ways to health-up appetizers at your weekend holiday soiree. Rich and bubbly dips and chips are some of the most tempting appetizers around. However, healthier fresh salsas and bean purées can be even tastier then some of the high-fat cheesy dips available around this year. Change dips from cream, fat or mayonnaise to dips made from low-fat yogurt, beans or hummus. When using mayonnaise use one part low-fat mayonnaise and one part fat-free sour cream. You’ll cut 1,058 calories and 138g of fat for one cup of mayo. It sounds simple, but include at least one healthy food item in your appetizer like fruit, vegetables or 100 percent whole grains. Find red and green fruits and vegetables that you can shape into a holiday scene. Cut the fat in half! Switch from whole-fat to lower fat versions for your creams, cheeses, meats and milk products. It’s easy to go overboard when it comes to pre-dinner cheeses. Try avoiding fat-laden varieties of cheeses and switch to low-fat cheeses like Swiss or mozzarella. Also skip creamier cheeses for dry, aged varieties and these cheeses are best enjoyed alone without the usual crackers. Try using fruit butters to jazz up your crackers or whole-wheat bread. Natural fruit butters are lower in calories (as low as 20 calories for 1 tablespoon) but tasty and sweet. Fast, easy and festive, nuts are an excellent party snack. Serve almonds or walnuts because they offer the best health benefits. Nuts have great protein and the fat in them will help keep you fuller. It’s not just for movie night anymore. Popcorn is a healthy whole grain and can be dressed up with flavorful herbs and spices for a special-occasion treat. For a simple microwave popcorn fix-up, combine 1/4 cup popcorn kernels with 1/2 teaspoon olive oil (or no oil) and fine salt in a brown paper lunch bag then microwaves it for about 2 1/2 minutes.